Refashion. Now there's a word you don't see very often on this blog. Sadly, I'm not one of those people who can take a voluminous grandma dress and instantly transform it into a trench coat... or a jumpsuit...or a pair of shoes... 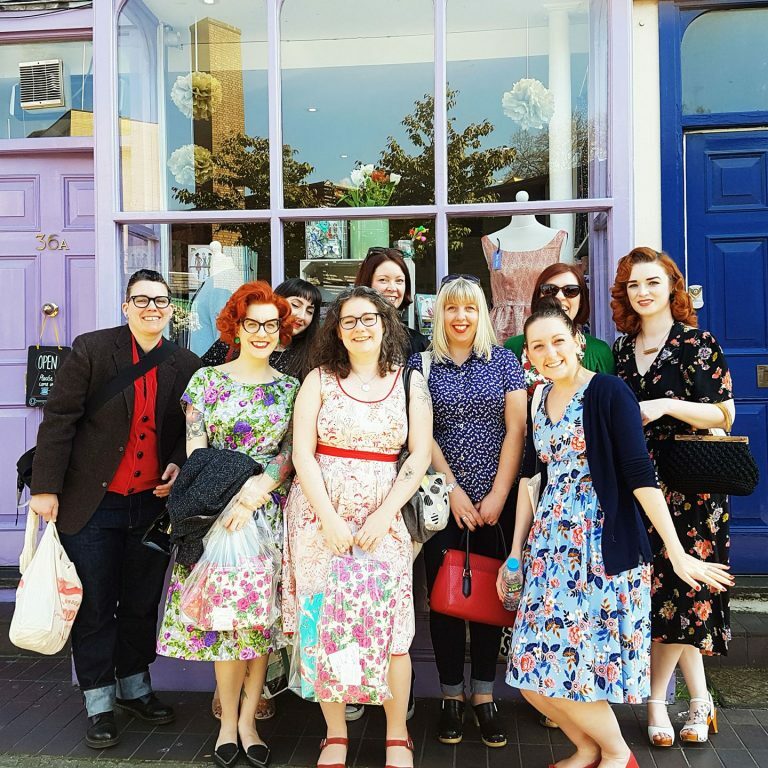 When the Great British Sewing Bee was on TV, I'd still be pondering what to make for the refashion challenge days later, whilst the poor contestants generally had about ninety minutes. Let's just say I'm not a natural. Very occasionally though, a garment will fall into my hands that's crying out to be turned into something else. 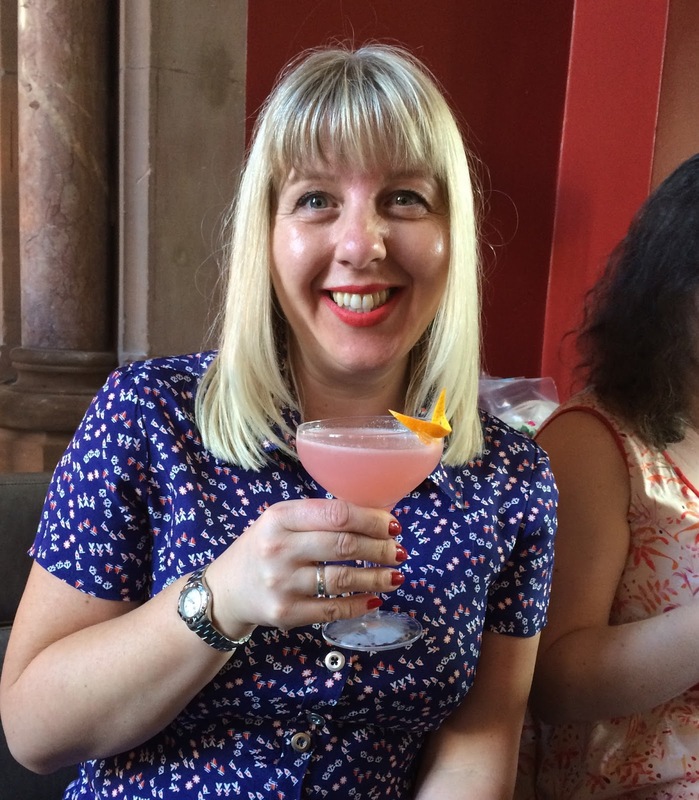 This happened recently when I was sorting out my wardrobe and came across this maxi dress. All I could think about was how much better it would look as a T shirt! 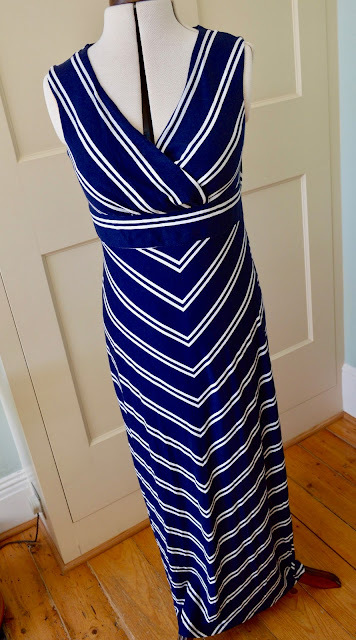 It's a perfectly nice dress, but I haven't worn a maxi since I was a child in the seventies (most people seemed to be in possession of one for parties), they're just not a style I feel comfortable wearing. My friend gave it to me a couple of years ago (I think she'd bought two by mistake on eBay) and despite good intentions, it's never been worn. The fabric is a stretchy chevron jersey with a nice drape and because it's full length, there's plenty of it, so I decided to see if I could turn it into a simple fitted T shirt that would get worn. 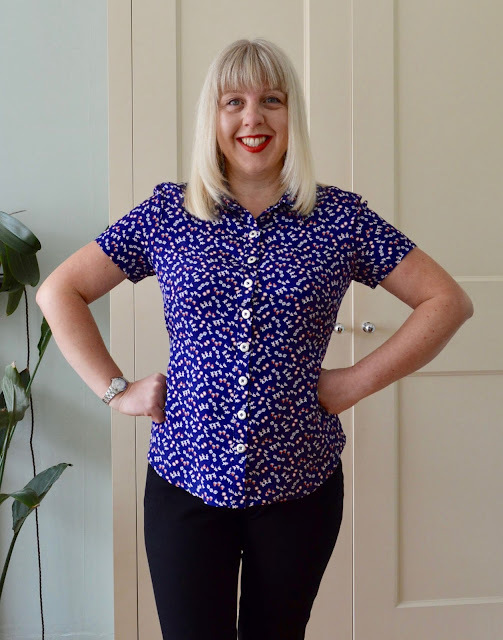 The pattern I used was the Agnes top by Tilly and the Buttons. First off I removed the weirdly short empire line bodice, which gave me enough uninterrupted fabric from the long skirt section to play with. 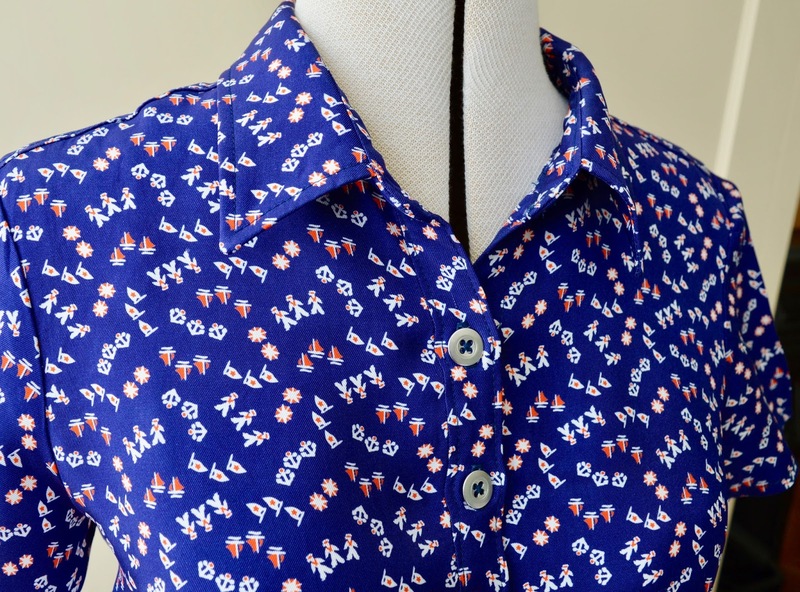 There was just enough to cut out a front, back, short sleeves and neckband. I kept the original hem and made sure the downward point of the chevron was directly on the fold when I was cutting it out, so it was centred. 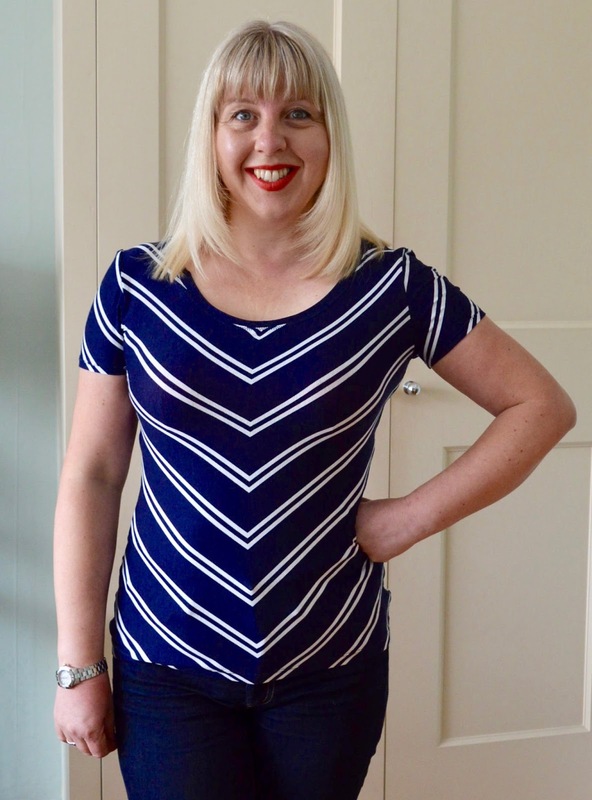 I also spent a bit of time trying to incorporate the ruched neckline, but the effect was completely lost amongst the chevrons, so I removed it. I wanted this version to be a tighter fit than my first version, so cut a size 4 all over, grading out to a size 5 at the bust. 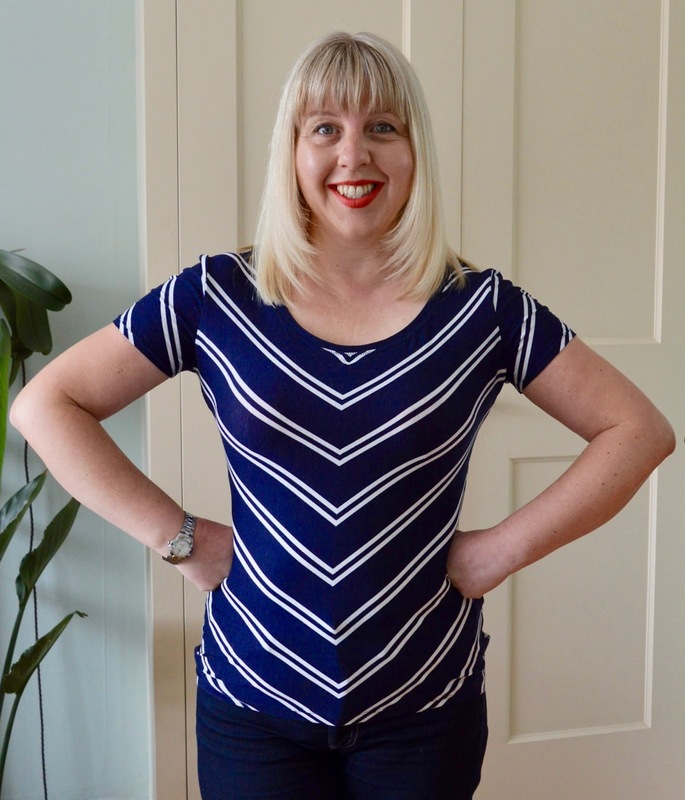 I think the fit is just right and I now have a go-to T shirt pattern that I can use again and again, yay! I have no qualms with the pattern: I love using it and always get good results. No, the baddie in this particular saga happened to be the fabric - it was an absolute nightmare. The culprit was a viscose twill with a lovely drape and slight sheen from Fabric Godmother (no longer in stock). The problem was it had so much drape it was barely usable. The first sign that all was not well was when I tried to iron it after pre-washing - it wouldn't stay on the ironing board and kept sliding off. I then sprayed it to within an inch of its life with spray starch. This stiffened the fabric sufficiently for me to cut the pattern pieces out, but it was still slippery as hell. The texture was horrible to work with too, a bit like having an entire garment made from grosgrain ribbon. I put the finished shirt through a rinse cycle in the washing machine, but I'm not entirely convinced all the starch has been removed as the texture is still a bit weird. Hopefully it will settle down after another wash. 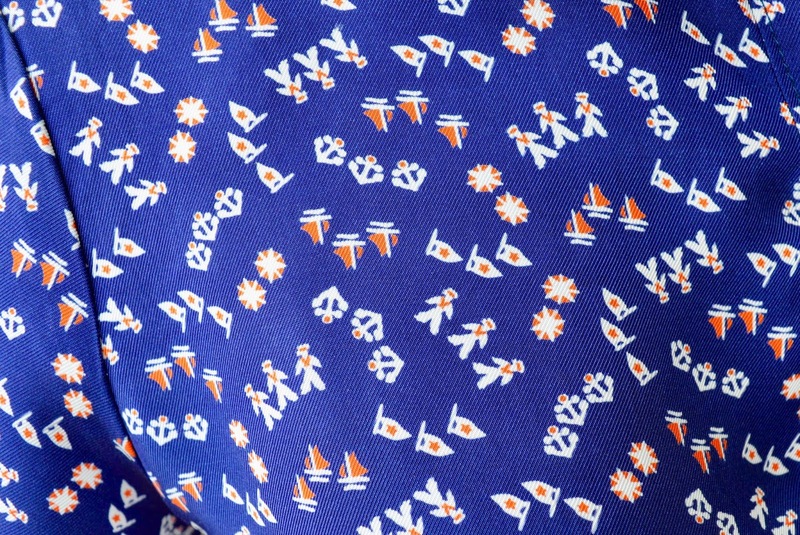 The reason I'd fallen for the fabric in the first place was the design: from afar it looks like a ditsy floral, but it's actually a nautical theme. Anchors, yachts, flags and, wait for it... sailor boys! 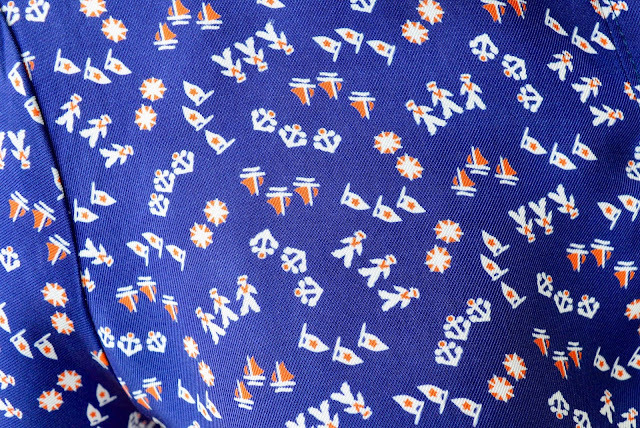 Adorable as those sailor boys are, they're not cute enough to make me want to work with this fabric ever again. I was actually quite resentful of it by the time I'd finished, which was a shame as I loved it when I first bought it and it certainly wasn't cheap (£17 a metre). On a brighter note, having made it several times before, construction was a breeze. The only time I ventured away from the instructions was to construct the collar - I used the Four Square Walls method which I prefer. If I were to make this shirt again (highly likely), the one thing I'd change would be to increase the size of the full bust adjustment as it's a tiny bit snug across the bust. After grappling with the fabric for what felt like months, I knew any kind of buttonhole mishap would nudge me over the edge, so I got the buttonholes made at D M Buttons in Soho. I added a couple more (well why not, if somebody else is making them?!) which was a sensible move. All my other versions have had to have secret buttons added to the inside to prevent gaping but this one seems to be fine so far. I personally don't think there are enough buttons specified in the pattern, so if you're thinking of making it I'd recommend adding a couple more. The buttons are lovely metal ones from the button shop in Berlin - I like how they pop against all the red, white and blue. 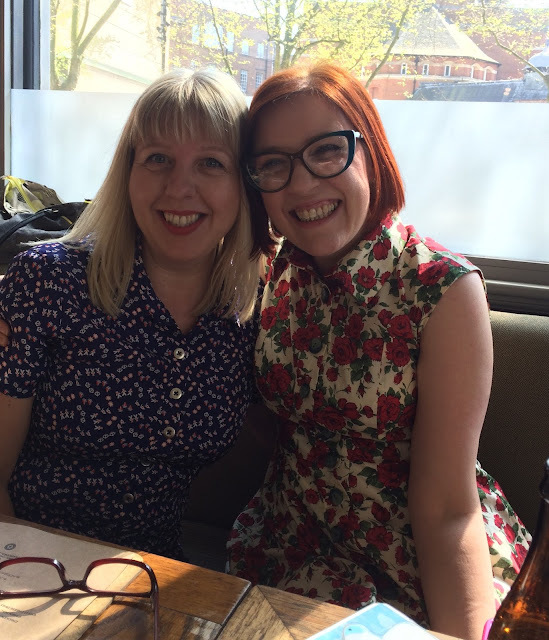 The shirt has already had its first full day's outing: a meeting with sewing pals to welcome Tasha and partner Mel to London last weekend. 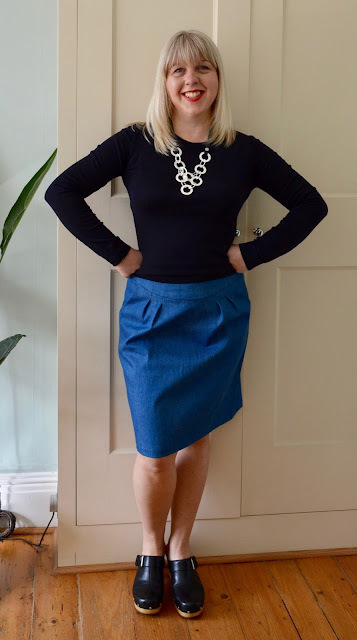 Who doesn't love a denim skirt? I've made plenty over the years (here, here, here and here) and I'm still not bored of them. When I was at the Knitting & Stitching Show recently I fell for some lovely bright blue seventies style denim from Guthrie & Ghani and immediately knew I wanted to make another one with it. The question was, what style of denim skirt to make? If you type 'denim skirt' into Pinterest, 99% of the resulting pins are either A-line button up styles, denim minis or a combination of the two. I already own a RTW denim mini which I hardly ever wear, and it seemed a bit pointless to make another one just for the sake of it. 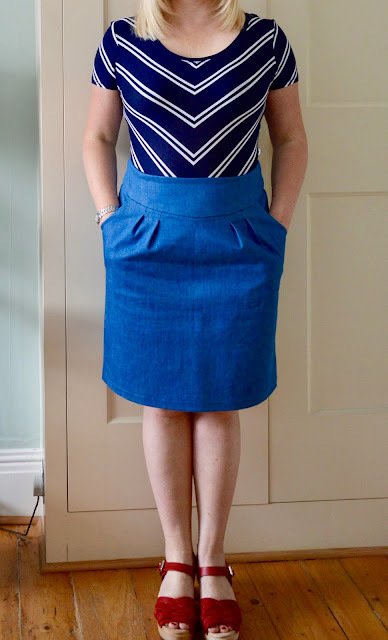 I wanted to use my denim to make a skirt that would be worn a lot, so I scrutinised my handmade wardrobe for inspiration. The two skirts that I wear the most are my barkcloth skirt made from a vintage pattern and my chambray Simplicity 2451. Both of them have just the right amount of ease to be comfortable, but are still a great shape. 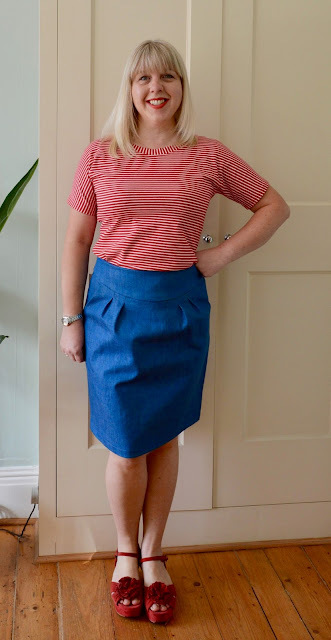 Having made the one seam skirt twice already, I decided to give the Simplicity pattern another go. Simplicity 2451 is quite an old pattern and tragically now appears to be out of print (oh no!) 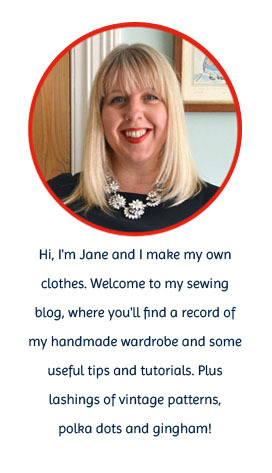 - I must get into the habit of sewing patterns when they're current rather than years later. If you can get your hands on a copy though I'd highly recommend it - it's relatively simple and very satisfying to sew. As per last time, I cut a size 12 of view C, with no changes and the fit is just right. The denim has a slight stretch, which always helps. Because I was using a thicker fabric this time, I used a precious fat quarter of vintage feedsack for the inside waist facing and the pocket linings. 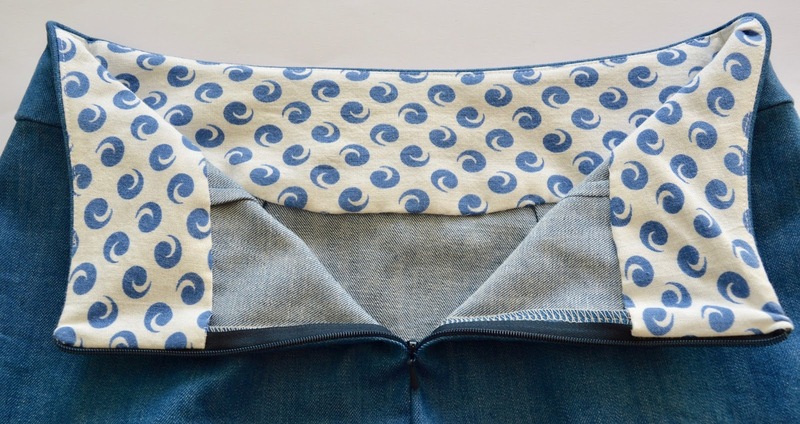 I love the contrast and the fact that the blue in the feedsack design is almost an exact colour match for the denim.